The term command economy refers to an economy in which the government dictates the production, supply, and prices of goods and services. In a command economy, the state owns and controls all resources, rather than allowing public supply and demand to influence the nation’s economy. The former Soviet Union and North Korea are two command economy examples, which are considered a socialist form of government. To explore this concept, consider the following command economy definition. noun. An economic system in which production and distribution of goods and services are controlled by the government. In a command economy, the means by which products are manufactured are publicly owned, though the actual production amounts are assigned by the government. This central authority assigns a production goal, which may be a certain number of items, then allocates the raw materials needed for the production run. This assignment of raw materials is important, as a certain amount of those materials are generally used for investment purposes, or sold to other countries as a source of income. The central authority may take into consideration any shortages or surpluses in deciding which products to have produced, and in what quantities. Consumers have little choice or effect on the economy, as they can only choose from the goods produced at the direction of the central authority. While the goal of any civilization is to maintain a stable financial system to support the people, governments go about it differently. Command economy and market economy represent polar opposites in economic philosophy. The primary difference between command and market economies lies in what factors dictate production of goods and supply of services, and how prices are set. A country maintaining a command economy, sometimes referred to as a “planned economy,” makes decisions based on macroeconomic goals of maximizing the country’s income, and ensuring economic growth. These considerations lead to determination of just which goods and services the country should produce, and how much of each should be produced. The government then assigns various production requirements to facilities, and allocates whatever resources are needed to meet the quotas. Many people associate command economics with communism. A small country maintains a command economy, with the government maintaining control of production and distribution of things it feels the public needs. When a neighboring nation threatens, sending armed patrols across the border, the government decides it would be in the public’s best interest to build up its supply of arms and train military personnel. It must then shift allocation of certain resources from producing things the people do not require, perhaps shutting down manufacturing of luxury clothing items. In this example of command economy, those production facilities can then be re-tasked to produce guns, missiles, and tanks. Others may be required to furnish ammunition, and resources are put into drafting and training soldiers. In a market economy, there is no central authority, or government office, that determines what to produce, or to control how resources are spent. Instead, consumers decide what they want by spending money to obtain those things. This, in turn, drives businesses to produce those goods, or provide those services. Also referred to as a “free enterprise system,” market economies operate based on supply and demand, with consumers benefiting from competition between providers. It is this approach that sets prices and availability of everything from food items to electronics, and even homes. The country’s government has very little, if any, power to direct production of goods and services, which are provided by laissez-faire the private sector. A market economy is also known as capitalism. Betty makes, by hand, the most beautiful rag and porcelain dolls. Soon her family members, neighbors, and others pay her to make dolls for them, so she develops a way to produce the dolls more quickly, and begins selling them. Dubbed “Betsy Blue,” the dolls catch on, and soon Betty contracts a production facility to make them, riding the wave of consumer demand. Over the holiday season, Betty’s income from her Betsy Blue dolls soars into the millions of dollars. In a market economy, Betty is likely to make a great deal of money as long as consumers remain interested in the dolls. Had Betty lived in a country with a command economy, she would likely be consigned to making the dolls at home, as production of items is controlled and directed by the government. It is doubtful the government would deem it important to relegate resources to production of such a luxury item. In fact, in countries with a true, strict, command economy, working a second job, or working from home, is illegal. Many industrialized nations today operate in mixed economies, where both consumer-driven market forces and the government influence the production of goods and services. It is common for market forces to primarily drive the mixed economy, while the government influences the economy from behind the scenes. The government’s influence in such cases is often in the wielding of money spent for the people’s benefit, and even in the types and amounts of welfare provided. Assisting the resources of low-income people stimulates buying, which in turn drives more production, and creation of jobs. Ideally, this would lead to fewer low-income people. North country’s economy is slumping. A large number of citizens have stopped buying many products because their earnings are too low to make them affordable. While the government allows free enterprise, many companies are failing, closing their doors because of their financial losses. North country’s government decides to increase the amount of aid it makes available to low income families, including food subsidies, rent assistance, and medical care. Slowly, because the people have more money to spend on necessities, and even the occasional luxury item, the economy takes an upturn, and recovers. The government has absolute control over the country’s finances, including setting salary rates for workers. The government has absolute power over all the country’s resources, and controls the pricing of goods and services. Both state-owned and privately owned companies are directed by the government. Cuba is one of the few countries in modern times that maintains a true command economy. The idea behind any command economy is initially to provide the necessities of life to the people, while maintaining a stable financial system. Like most systems, there are problems, however. For instance, in Cuba, housing costs are very low, but none of the citizens can own their own homes, because the government owns them all. Education, healthcare, and transportation are free or low cost, but there is overcrowding, which limits the services that can be provided to so many people. The Cuban government controls salaries, which tend to be just enough to get by. According to the 2016 Index of Economic Freedom, the tax rate in Cuba is as high as 50 percent. Adding that to state-induced low wages, many people turn to doing additional work “under the table,” which is illegal. Although most people believe that the United States has a free enterprise, or market economy, it is actually a mixed economy. There is no doubt that consumers in the U.S. drive commerce, in a complex dance of supply-and-demand. The government does have a hand in guiding the nation’s economy, however. For instance, the United States has always maintained a public school system. Though there is no prohibition against, and a number of providers of, private sector schooling, the vast majority of Americans attend public schools, which are regulated and funded by the government. Federal and state regulations on production of goods, and provision of services, affect prices of those items, which trickles down to consumers’ willingness and ability to pay higher prices. In addition, the government provides certain services directly to consumers, such as postal services, building and maintenance of roadways, and maintenance of a strong military. The government steps in to ensure the public is best served by private enterprises that hold a monopoly on services necessary to everyday life, such as providers of electrical services, communications providers, and mass transportation providers. These private enterprises are allowed by law to make a reasonable profit, while the government prohibits them from raising prices unfairly. Congress and other governmental entities, such as the Federal Reserve System, exert control over extremes of inflation and depression, often by raising or lowering tax rates, and interest rates. The government provides other direct assistance, such as asserting tariffs on products imported from other countries, effectively limiting competition that could drive American businesses under. The government provides direct aid to farmers, offering cash subsidies for their crops, or paying them to hold back a portion of their yields. This type of aid not only benefits farmers, but inhibits market flooding of certain products in an attempt to keep prices stable. Finally, social service programs help provide food, medical care, and other necessities to the elderly and disabled, and to low income families with children. While free enterprise thrives in the U.S., there are many examples of command economy within the nation. This type of mixed economy is present in many nations today. Capitalism – An economic system based on private ownership of capital, production of goods, and provision of services. Communism – An economic system based on government control of all capital, production, and distribution of resources. 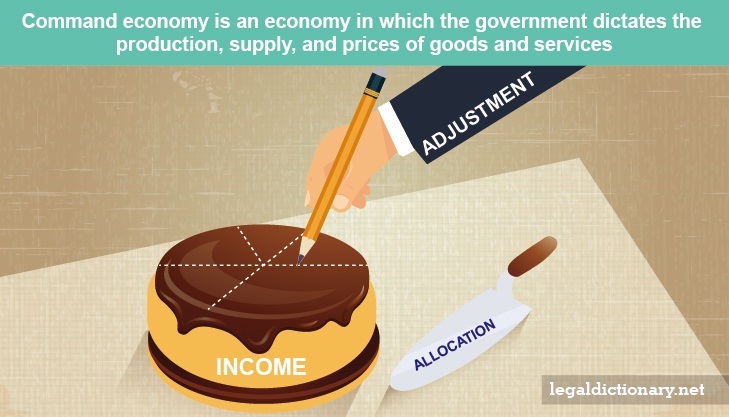 Economy – The process by which goods are produced, products are sold, and services are provided in a country. Laissez-Faire – A philosophy of letting things run their own course, without interfering. Especially in an economic system in which the government does not interfere with transactions between private parties.